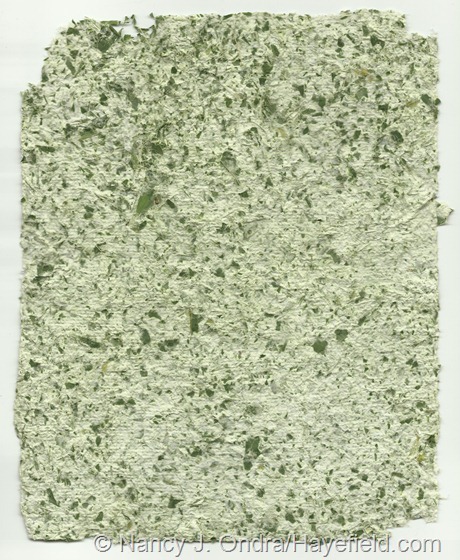 There are a variety of ways to turn plants into paper, many of which involve cooking plant parts with caustic or possibly dangerous materials, such as soda ash, to release the fibers – reportedly a very smelly process. As I wanted the project to be both kid- and kitchen-friendly, I investigated a couple of chemical-free techniques. …and golden Hakone grass (Hakonechloa macra ‘Aureola’).. These pieces are interesting to look at, but they’re really too loose and brittle to be useful for anything more than framing. I also decided to pour the prepared pulp directly into a mold, instead of the usual way of adding the pulp to a tub of water and dipping the mold into the pan to lift the pulp. This way, I was able to make each sheet separately and experiment with lots of modifications. This approach produces a relatively thick paper that’s great for a variety of crafts. For full-sized sheets, I stretched plastic window screening over one right-side-up, wooden picture frame and secured it with push pins. 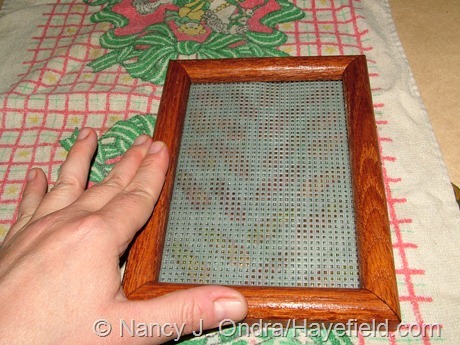 The top part (known as a deckle) was another 8- by 10-inch picture frame, turned upside down and secured to the mold with two rubber bands. For smaller pieces, I turn a 5 x 7 frame upside down and lay a piece of plastic needlepoint canvas into it. 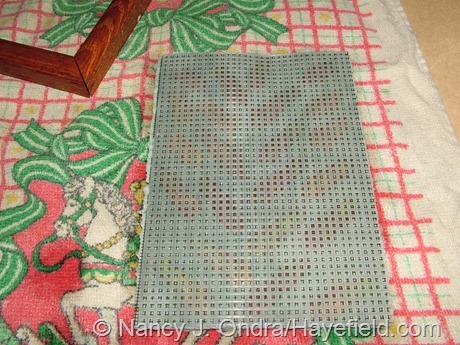 I sometimes use an additional piece of screening, as shown below: plastic window screening cut to the same size as the plastic canvas. …and golden Hakone grass (Hakonechloa macra ‘Aureola’). 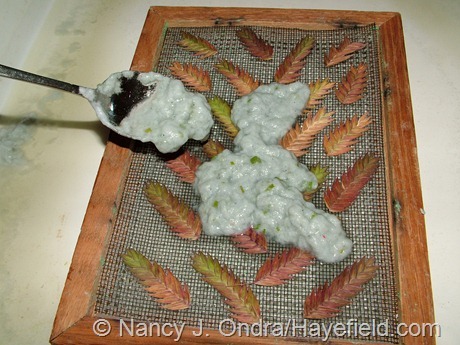 Once you start using paper pulp as a binder, you’re not limited to just leaves. Adding flower petals, for instance, creates some very pretty effects. For best results, use very small or relatively flat blooms; on larger blossoms, pull off the petals or individual florets. 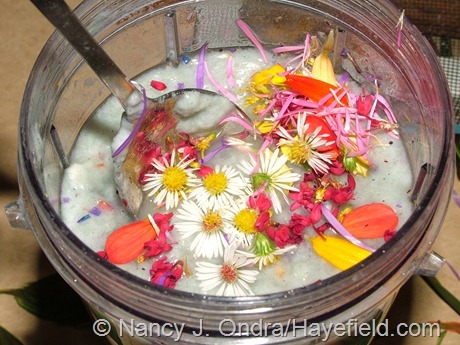 One thing I learned is to not blend the petals with the pulp, as shown above. 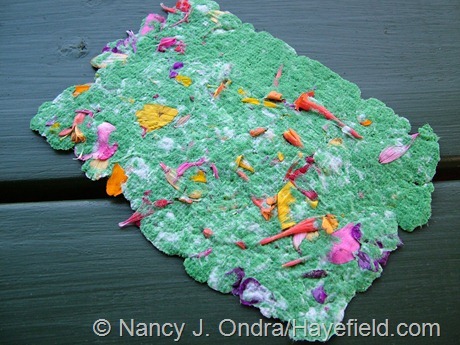 The fresh pulp looks nice, but as the paper dries (below), the color leaches out of the torn petals and causes staining. Gently stirring the petals into the prepared pulp produces much better results. 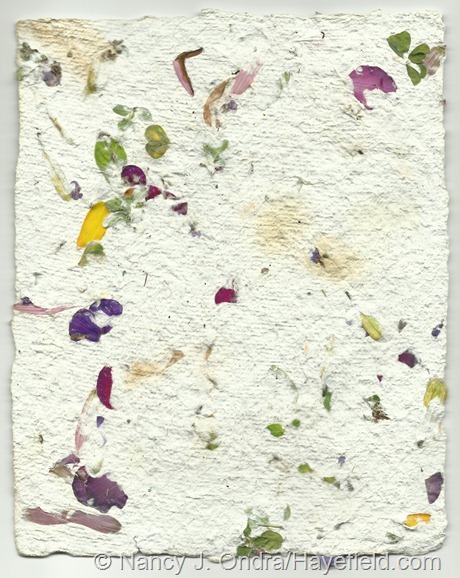 Below is a mix of fresh petals and leaves. 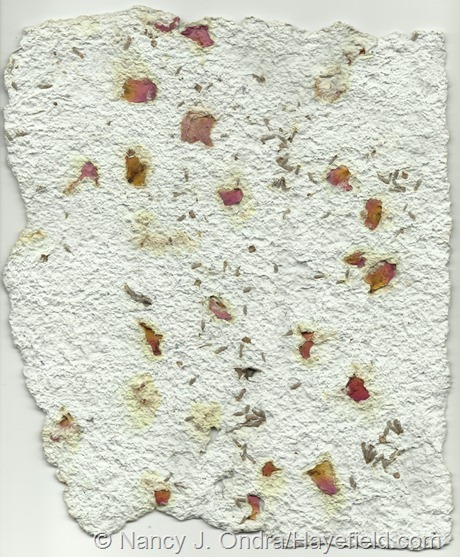 For the piece below, I added dried rose petals and lavender. 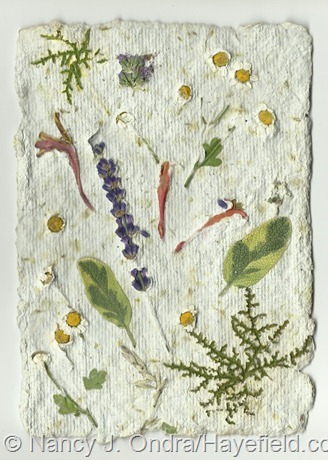 For “herb paper,” I used a variety of small flowers and leaves, including lavender, curry plant, lemon verbena, lemon balm, thyme, anise hyssop, purple basil, rosemary, and winter and summer savory. 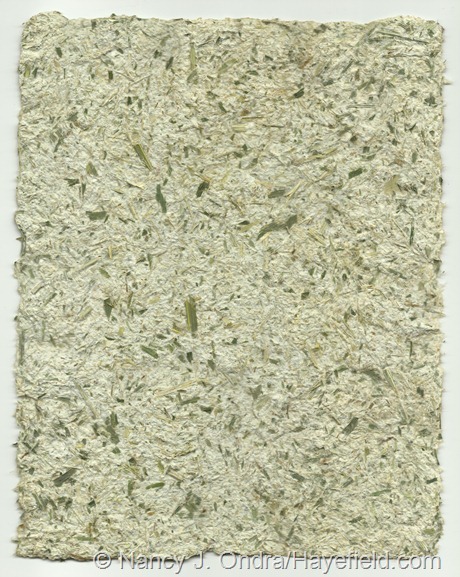 I’d hoped that the herb paper would have a nice scent, but it wasn’t all that noticeable, except on the sheets that included curry plant (Helichrysum italicum) leaves. There’s an easy way to add fragrance to any handmade paper, though: simply add several drops of your favorite essential oil to the water when you blend the pulp. Or, blend in a pinch of a fragrant spice or spice mix, such as cinnamon or curry powder. 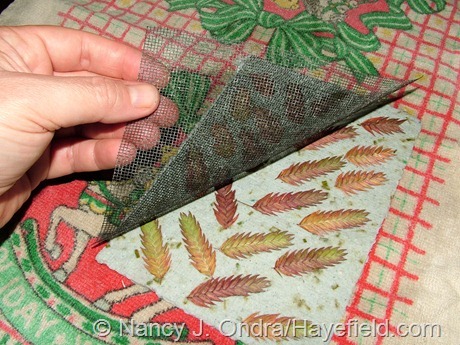 Seeds, too, make a super addition to homemade paper. 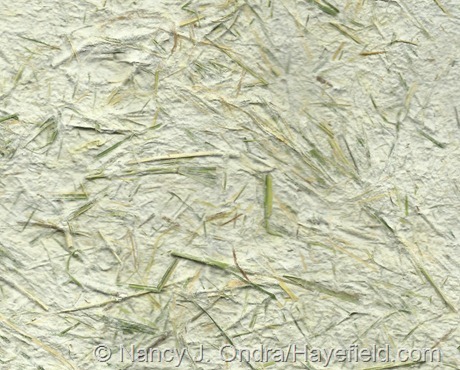 The piece below includes Mexican feather grass (Stipa tenuissima) seeds. 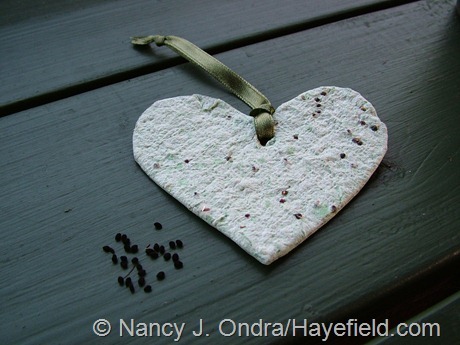 As with flowers, it’s best to use small or flat seeds. 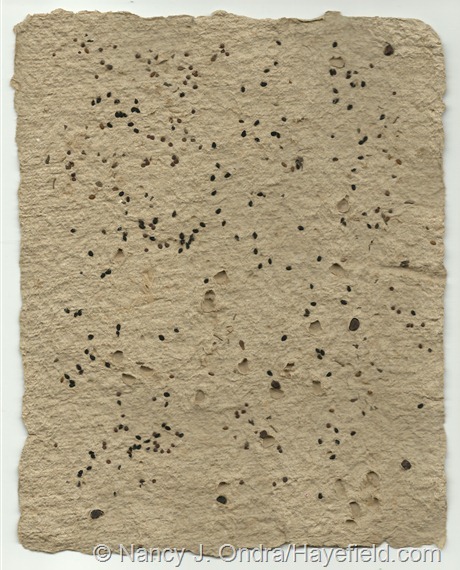 In the piece below (made from pulp from brown-paper napkins), most of the morning glory seeds fell out of the finished piece, leaving little craters, because they were too lumpy. The love-in-a-mist (Nigella) seeds were fine, though. 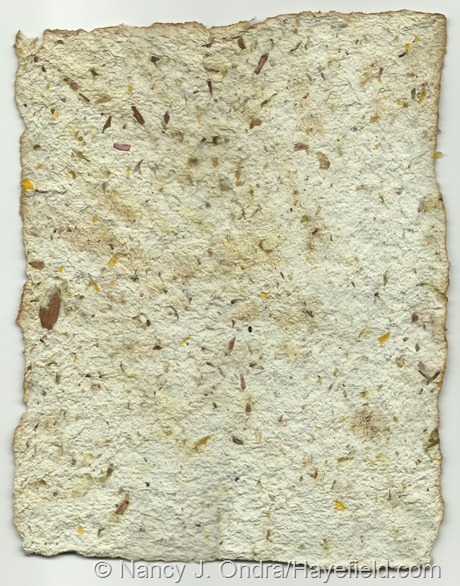 The really neat part about adding seeds is that you can actually plant the finished paper. As long as the paper dries quickly (I’d say about 8 hours or less), the seeds will not sprout until you wet the finished paper again later on, put it in a clear plastic bag or lay it on damp seed-starting mix, and keep it moist. The piece above includes kohlrabi seeds. 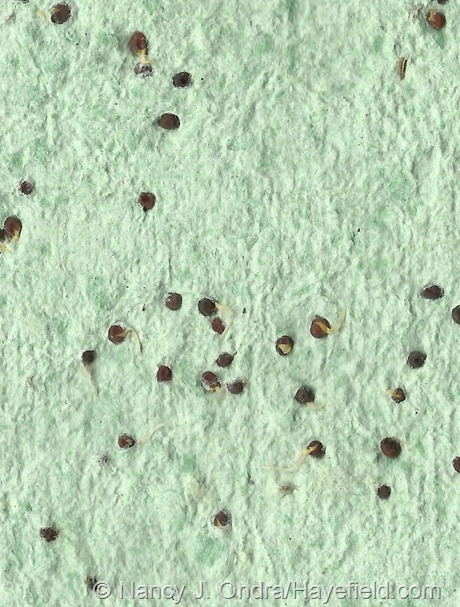 I made it during a spell of rainy weather, so it stayed damp for a few days and the seeds started to germinate before the paper even dried, as you can see below if you look closely. 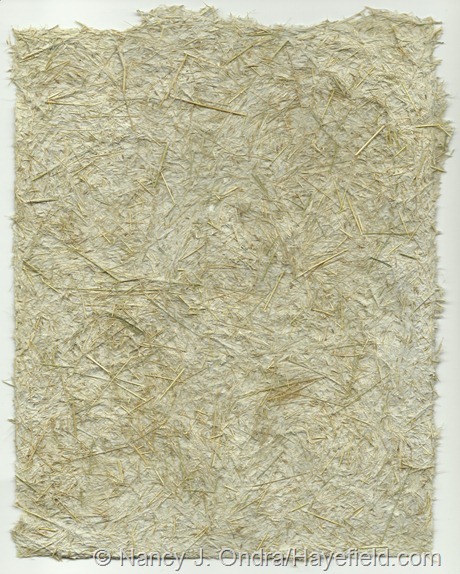 …as do plant or animal fibers, such as cotton, wool, dog or cat hair, or (in the piece below) alpaca fleece. 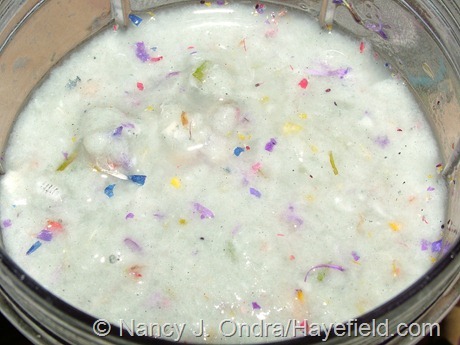 A piece of advice here (which ought to be common sense, but…um…it’s easy to get carried away when you’re having fun): Do not try to add the fiber to the soaked scrap paper before blending it into pulp. It will make your blender very unhappy, as you end up with an icky and difficult-to-remove wad of fiber wound around the blades. 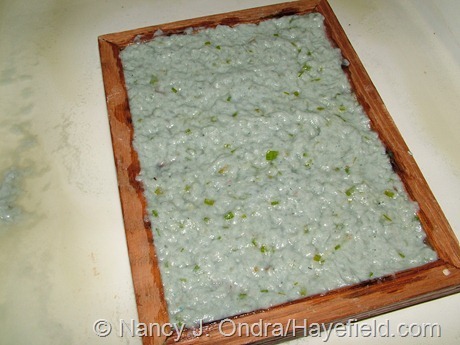 I had better luck either pulling the fibers apart and pushing them into the already-blended pulp with my fingers before pouring the sheet, or else spreading the fiber over the mold screening and then pouring the pulp over it. 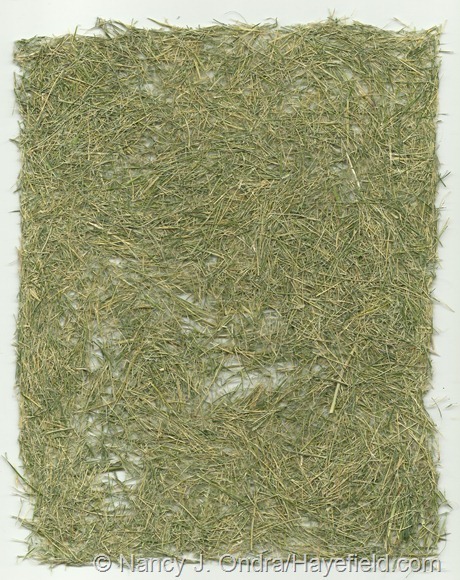 …I hoped the resulting paper would be reddish or pinkish, but it was a soft green instead. 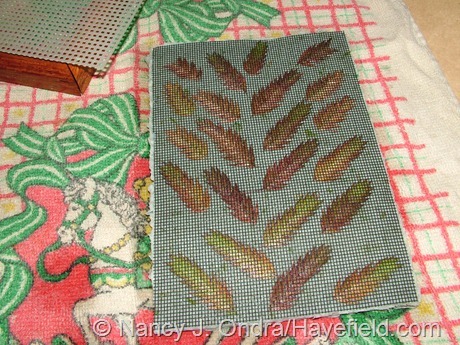 Another way to add color before pouring the sheet is to add a few drops of food coloring to the scrap paper before blending. Or, add some ground turmeric or curry power for a yellow tint. 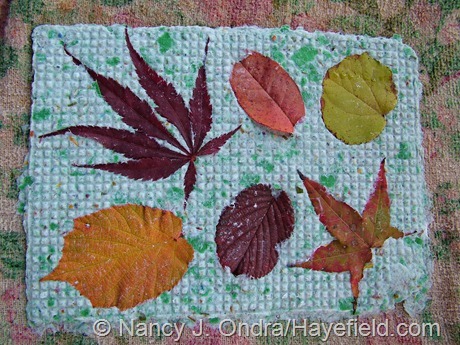 Once the paper is dried, you can easily spruce it up with dyes or watercolor paints. 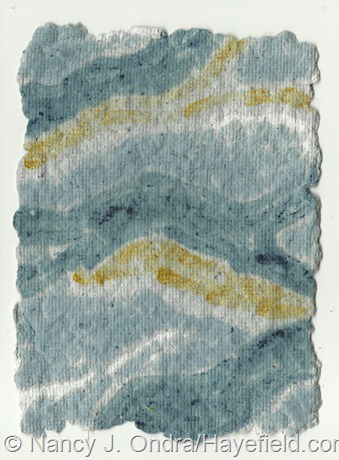 On the piece below, I used some blueberry (light blue), black-currant (medium blue), and turmeric (yellow) dyes left over from another project. The best thing about using this pouring technique, rather than dipping, is that you can easily embed interesting objects into each sheet. For the project below, I used the seedheads of northern sea oats (Chasmanthium latifolium), with some of the still-green leaves snipped into the pulp. Instead of pouring the pulp over the items, which can cause them to shift, carefully spoon it into place. Once the pieces are covered, you can gently spread out the lumps to evenly fill the mold. …and then remove the window screening and move the sheet (still on the towel) to an airy place to dry. 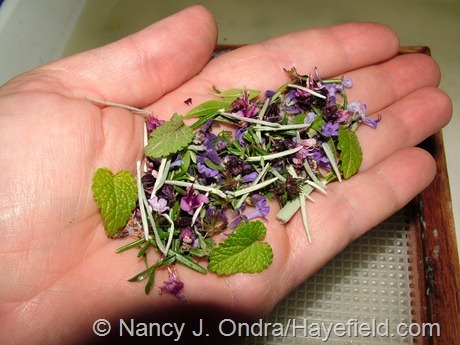 I also had a wonderful time playing with embedded herbs and flowers. 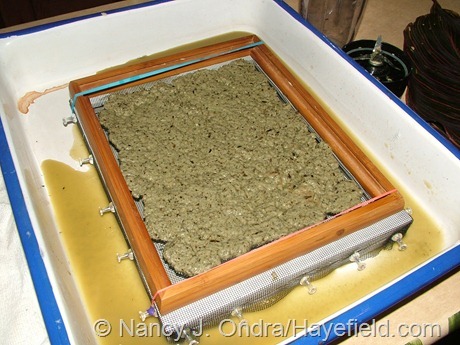 For the one below, I placed some herb leaves and flowers directly on the screen and stirred the rest into the pulp before pouring. Fall-colored leaves work great too. 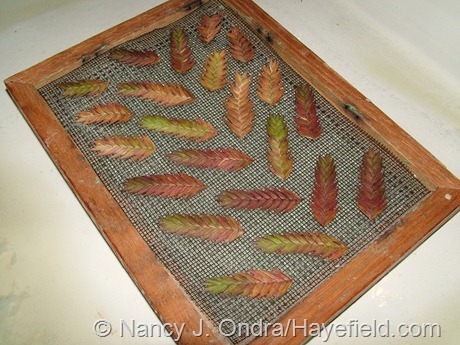 One tip here (which works for any leaf or flower, really): pick them ahead of time and let them sit out for several hours or overnight, so they wilt a bit before you place them on the screening. 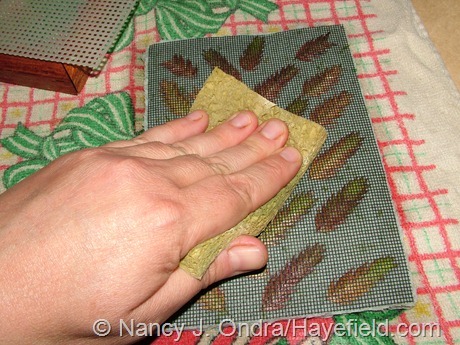 The softened leaves will press into the pulp much more readily. I did the piece below with just-picked leaves, and you can see one side of the oval stewartia leaf popping out of the finished piece. 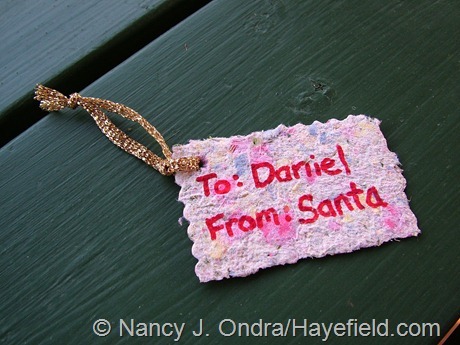 Other fun things to embed in paper include pine needles, small feathers, tiny beads, and bits of string, ribbon, or fabric. 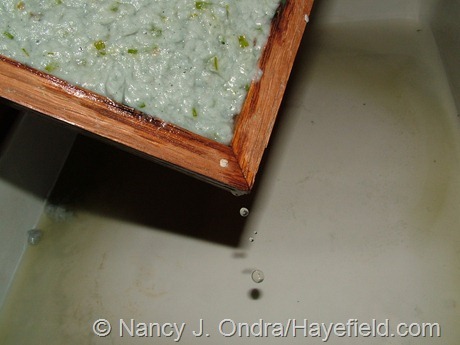 Another advantage of the pouring technique for paper-making is that you can create a variety of shapes and sizes, not just full sheets. Spoon the pulp onto the screen and use the back of the spoon to shape the edges. So, what can you do with your finished paper? 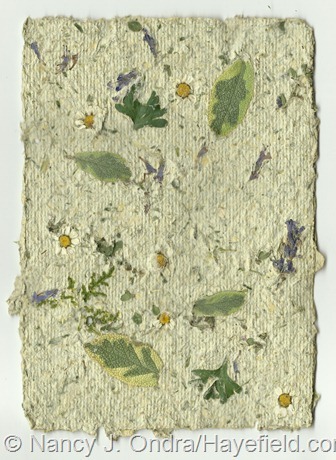 Frame it as artwork, craft it into notecards, or use it for endpapers for handmade books, among other things. 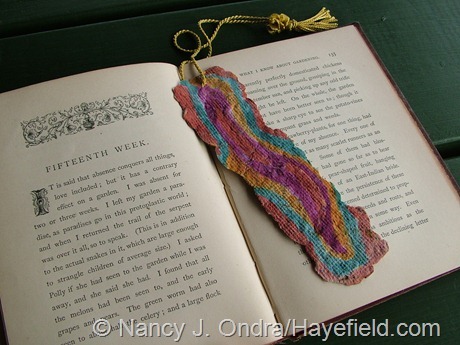 …or bookmarks. I probably wouldn’t recommend using those with leaves or flowers in them in valuable books, or leaving them in one spot for more than a few days, though, since I’d worry about the plant bits discoloring the book pages. 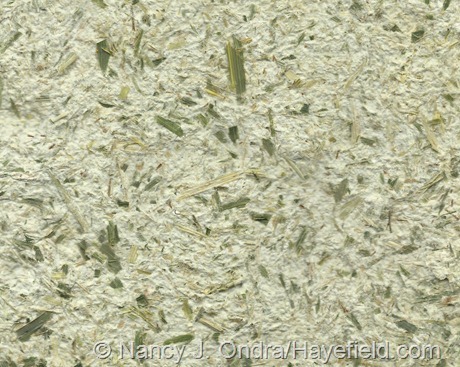 So, that’s it for making paper with plants (and without chemicals). Back to the garden for Bloom Day on the 15th! Nan, this is absolutely fabulous post! As a paper artist (I work with paper, but almost never make my own), I find what you’ve done to be incredibly creative and novel. 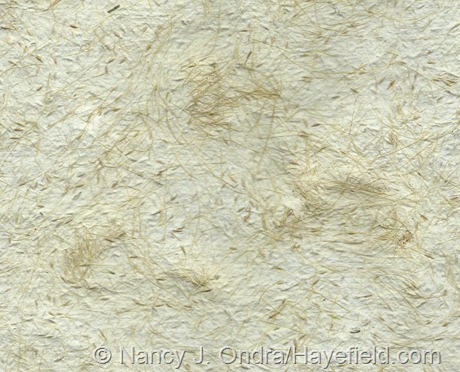 The effects you’ve been able to achieve with the alpaca fleece and onion skins are amazing – definitely unique and also my favorites. The hakone- and feather grass-pulp mixes and the canna and pulp rank high on my list of faves as well. I can think of so many ways to use them, layered on the front of cards. Are they solid and sturdy enough to be glued or attached with hardware to a card base, and then to have something attached onto them? 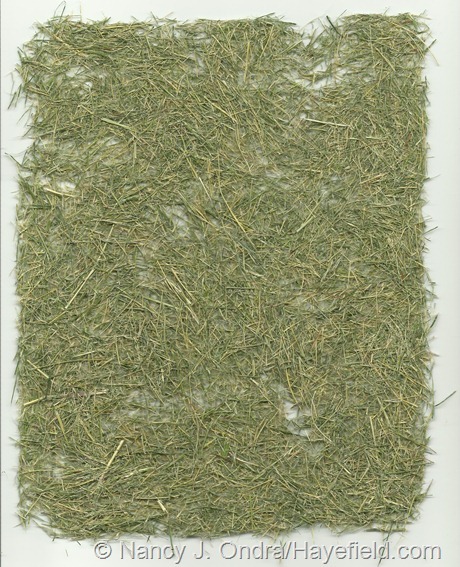 I have some experience with lavender, enough to know that the color and the fragrance of the buds and flowers do persist, but I have no experience with most other herbs or plants. I’ve pounded lavender and roses into watercolor paper and used leaves as stamps, but that’s about the extent of my experimenting. 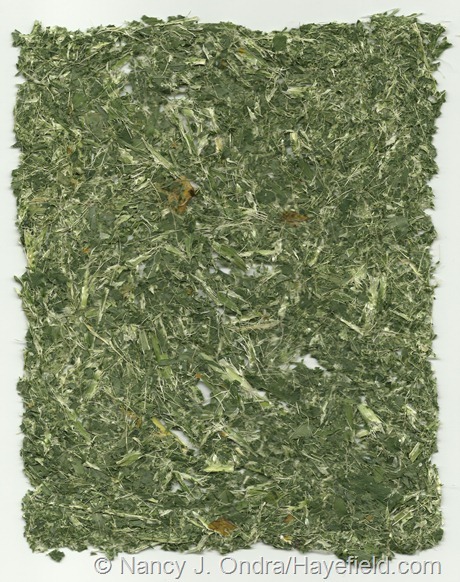 The sheets you made with embedded herbs and leaves are stunning. Do you have a sense as to how long they maintain their color. 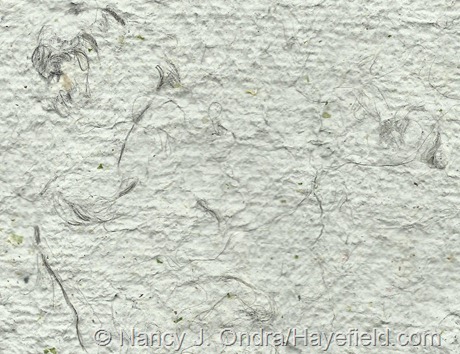 The color in the photos is so vivid and lifelike – does it persist after the paper is dried? 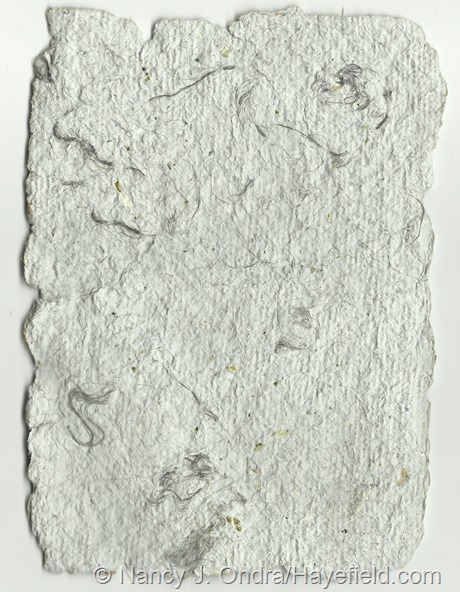 Do you find that the leaves dry and flake from the paper over time? The sage is amazing and I’m guessing that tricolor sage would give a truly gorgeous effect. Since it remains “soft” even after it dries, I wonder if that makes it more suitable for something like this? I can’t wait to explore all the goodies you contributed to HGTV. Are they on line yet and available? I can hardly wait to see what else you’ve come up with! Hi Cathy! I was hoping you’d see this and possibly find it of interest. 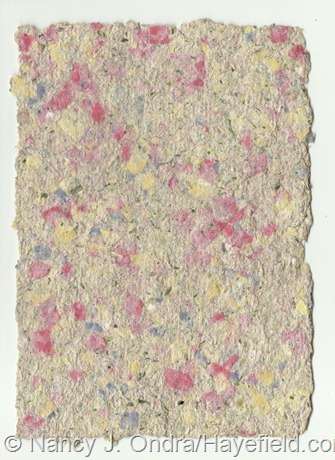 The plant-and-pulp papers are definitely sturdy enough to be glued to something, or to have something glued to them. So far, the embedded bits are holding on well to the paper. I don’t handle the sheets frequently, but they’ve been piled up and moved around my office several times over the past few months with no damage, and I’ve been able to cut and craft with them without them crumbling. 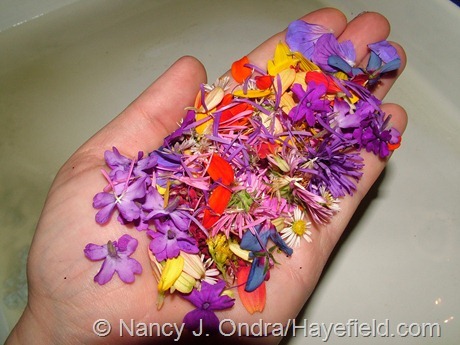 The colors of the herbs and petals after a period of time is variable. After three months, the white petals (as on Roman chamomile) have turned creamy tan, and some of the intense greens (like parsley) have bleached out, though chartreusey greens still look good. 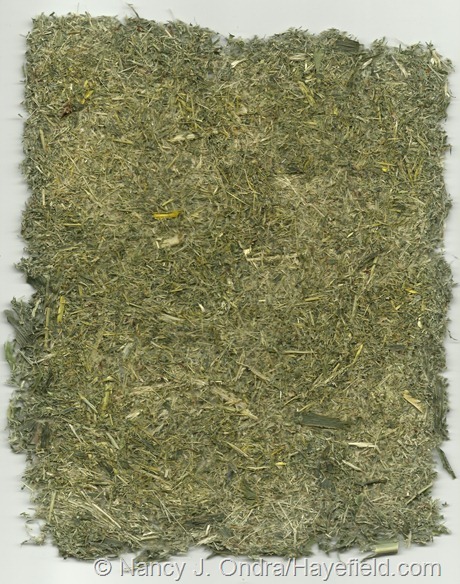 I did try ‘Icterina’ sage, which looked lovely at first, but now the yellow and green parts have blended into each other. So far, bright yellow and purple-blue petals seem to be holding up the best. I think you’d have a really good time experimenting with this technique. 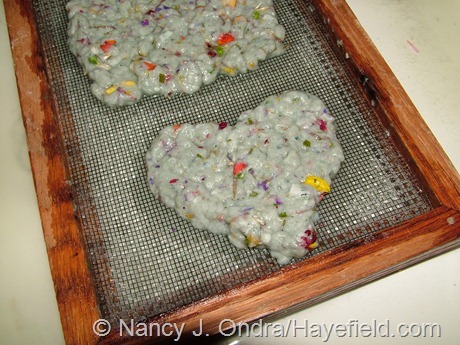 I’m sure you still have lots of rose petals to work with! Some of the other pieces I’ve written are already up on the HGTV site; others aren’t yet. 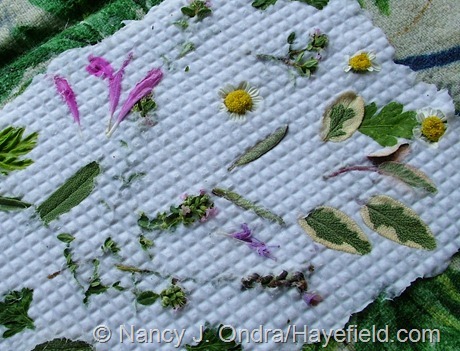 I do hope to blog this winter about the details of another one of my favorite projects: using edible plants to dye fabric. I don’t know if anyone else is reporting problems with posting a comment to your blog (or if you’ve noticed a drop off in comments) but I’ve been having trouble for a couple of months. I used to be able to just fill in name, email, and web address but now WordPress asks for a password, which meant I had to actually register for a WP account, which I did either last month or the month before when I was trying (unsuccessfully) to post a comment. After you enter the PW, you’re redirected to a WP blogger site, not back here, and the reply you’ve typed is lost. The only reason I was able to post the above reply (which was also a “rewrite”) is because I had the foresight to copy it before I submitted so when I got to this point again after signing in, I could paste it. Anyway, now that we’ve survived the summer drought and all of the work in the garden, I have more time to experiment. I did find your recipe and instructions for the paper on the HGTV website and it looks very easy. I’m going to give it a shot and see what I come up with! I’ve got lots of lavender in bloom so I plan to start with that and I thought I might give rosemary and sage a try as well. I’ll be sure to share my results. Hi Cathy! I’ve had one or two other commenters mention that they had some trouble over the last year, but I don’t know why that is, because most of the comments that come through are from people who don’t have WordPress accounts. I did get two copies of your original comment, so they came through ok, but I’m sorry you lost the time you spent on the original of this one. I’ll see if I can find any info on this problem. Good luck with your paper-making adventures! Really interesting, and I love the results of some of these trials — thanks for taking the time to go through so many variations. 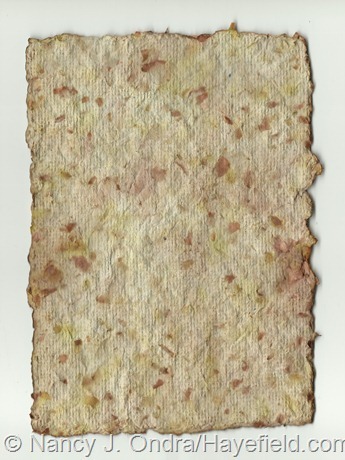 The onion skin paper is my favorite, and the construction paper “confetti’ paper is a close second. Thanks, Alan. I promise that I’m working on the photo challenge you set me a month or two ago, and that there will be plenty of garden pics in future! Nan, do you mean HGTV is adding garden back into their Home and Garden programs? I can’t speak to their television programming, Carolyn, but the folks who work on the website are certainly enthusiastic about frequently adding new content. I’m always trying to figure out ways to decorate my walls without it being overused or kitschy… and this is the perfect solution!!! 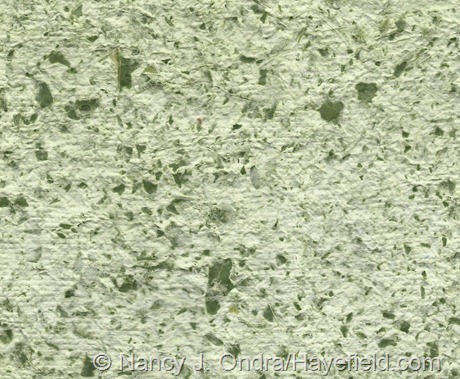 Oh, Donna – you should see what a dye made from yellow onion skins can do for fabric…but that’s for another time. 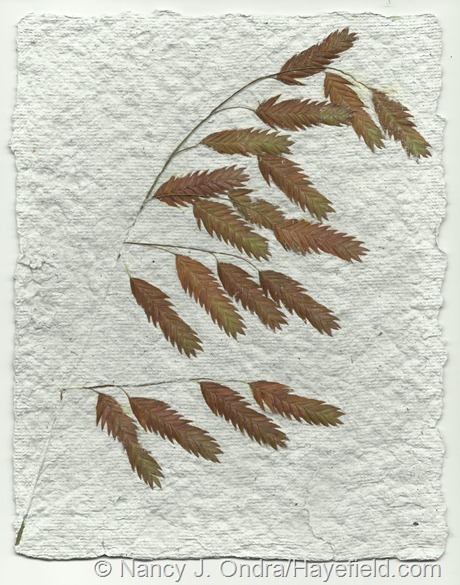 The northern sea oats seedheads are perfect for paper-making, being so flat. And, there’s certainly never a lack of them! Have a great time with your own experiments. Once you get things set up, you can easily make a dozen or more sheets in just 2 or 3 hours. You have been having too much fun. 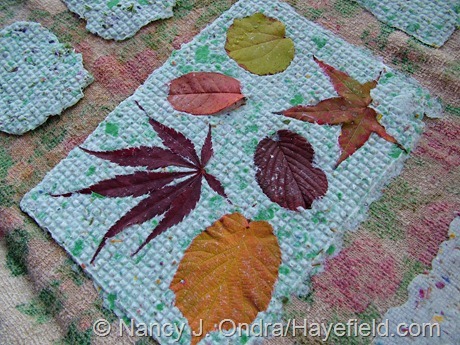 I have bought paper with leaves etc imbedded in it but this would be a fun project. I can’t believe that I actually get paid to do stuff like this. It’s always something I’ve wanted to try, but I kind of doubt I’d have ever gotten around to actually doing it without this excuse. 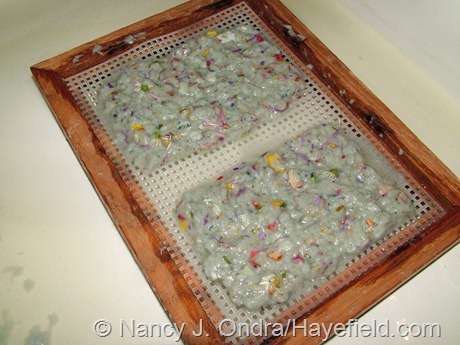 I have so many hobbies already, but this makes me want to add paper making to my list! Thanks so much for the explanation and great photos! Maybe try thinking of it as a form of recycling (something virtuous) than a hobby (something indulgent)? It’s a great way to use up all the paper scraps from your office shredder, at least. Have fun! I’m happy to know you are writing for HGTV. I didn’t think I would have a comment on this post but…We just had the opportunity to visit the NY Botanical Garden. It was wonderful and made me wish for more ground:) I digress. In the gift store were commercial notecards embedded with seeds that when wet and planted would grow. I thought that interesting. And even more interesting that you have already created something similar. Hey there, John. I was always a bit skeptical about those seed papers, but they really do seem to work – at least, as far as I can tell from my experiments. 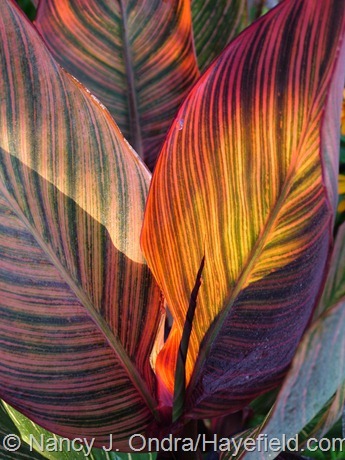 Plants are so cool! Marvelous post! I loved the northern sea oats! I started out with a single one gallon pot of those 15 years ago and now have 6 large clumps at various places in the garden. I try to remember to cut off the seeds late every summer so I don’t get all the “volunteers” the next spring. Now I know what to do with them, other than leaving them for the birds! 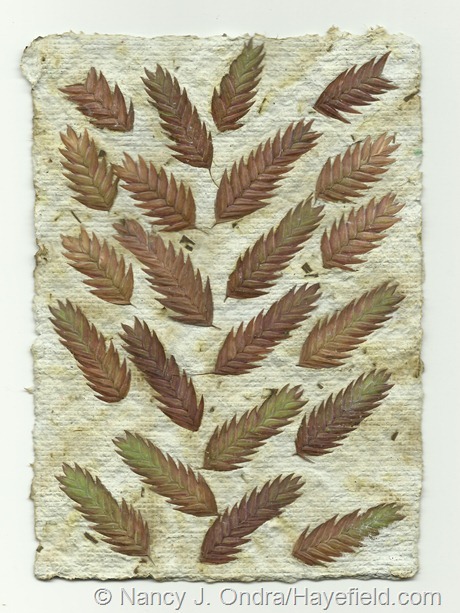 Fern fronds might lend themselves to being embedded in paper also, don’t you think? I have always wanted some of those lovely botanical prints, matted and framed, to hang over the couch. With this technique I could make my own right from the garden and I bet they would look great! You could make a whole lot of paper with that many sea oats, Kate. And yes, ferns would be terrific for this technique – brilliant idea! Very cool post! 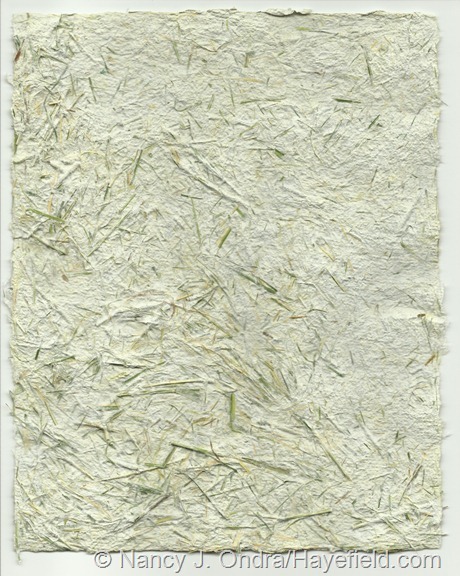 I like the paper with the embedded leaves and the sea oats. 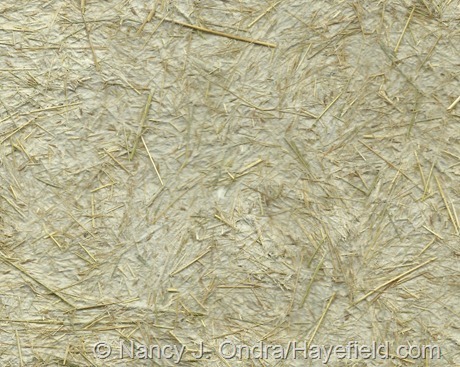 If you have a pond or a friend with a pond, you can make paper from string algae–no paper pulp required. 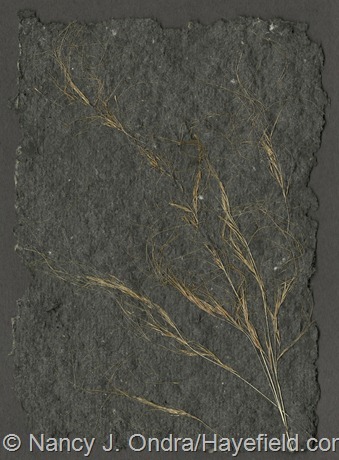 The stringy tough nature of the string algae makes a really strong paper! It turns pure white, too. That’s so cool, Hoov – I had no idea. Now I need to find an easily accessible pond for further experiments. Thanks so much for sharing that! My poor mail carrier. She probably wouldn’t be thrilled to know that the unmarked cardboard boxes she delivers to me once a month in spring and summer contain parasitic wasps to control flies around the boys’ manure pile. But she’d likely be appalled to know she was delivering pond algae! Another wonderful post, Nan. You are such an organized, thorough writer. Thank you for sharing all of your paper project! I like the stem of sea oats best I think…. though I know my girls and I could spend hours making flower papers. Thanks! It’s very easy to get carried away, but it doesn’t take a lot of either scrap paper or plant parts, so really, you’re limited only by the number of dish towels you have available for the fresh sheets of paper. On a nice dry day, I’ve found that I can gently peel the damp sheets off of the towels after an hour or two, then reuse the still-damp towels if needed. Have fun! What a great post. So inspiring. 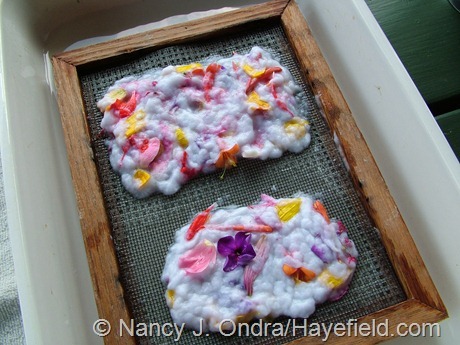 Paper making gives us so much room to experiment and have a good time – even with children. 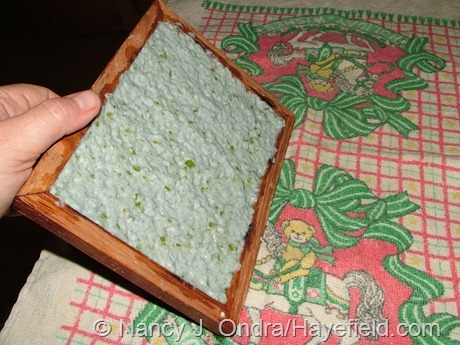 This past summer we made some flax paper at Historic Deerfield which is near us, with grandchildren. Most instructive. HD even grew and processed their own flax. That sounds like a really interesting experience, Pat. I bet it really was fun for the kids. I had a splendid time making a mess of my kitchen during my experiments! How lovely and inspiring! This could be a great group project. My faves are the sea oats spray and the black paper and Mexican feather grass. What did you use to make the paper black? I’m such a klutz, not sure I would end up with more than a gloppy mess. The gloppy mess is part of the fun, PG! You can’t really mess up with this. 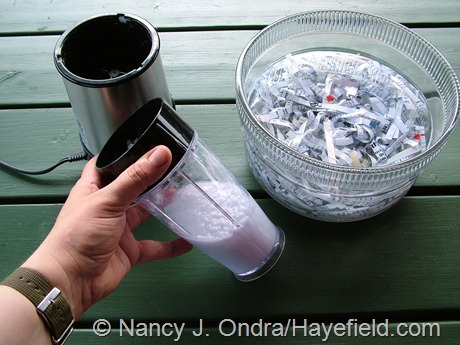 If you don’t like the finished paper, tear it up, soak it again, and put it back in the blender. The black paper was from half white scrap paper and half black construction paper blended into pulp. 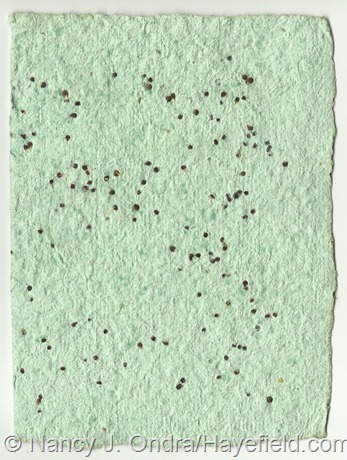 Wow – gourd pulp paper – what a great idea. Thanks for sharing that! Got to your post by accident but I love it. 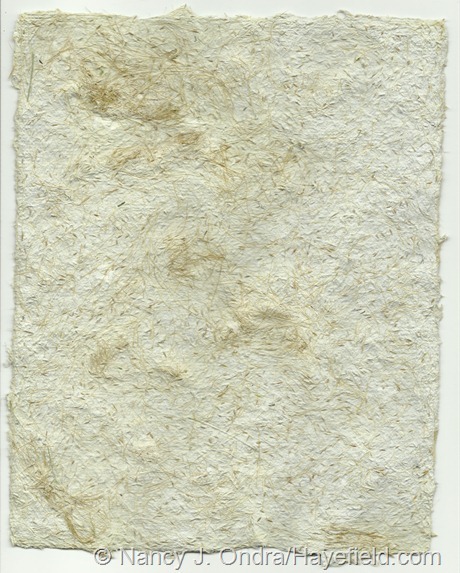 As a former art teacher, I used to make paper with the students. 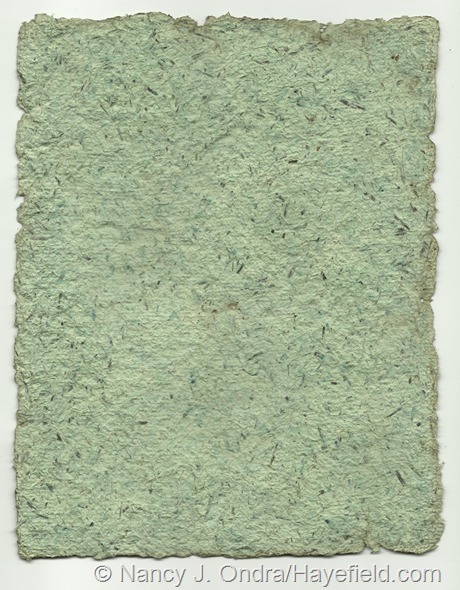 I would ask them all to bring in some lint from their dryers and I would add that to the torn paper pulp. We would add bits of art room leftovers, as well. I did some Valentines with the younger students. Welcome, Pamela. I can imagine how much fun your students had with a project like this. The dryer lint is another great idea. There are just so many possibilities to try!